Finally learned how to set up an FF. I don't know if it's fast but it feels really good, miles better than my old tunes, so expect some FF personal bests from me in the coming week starting with the DC2 Integra R.
the dc2 is an excellent car. 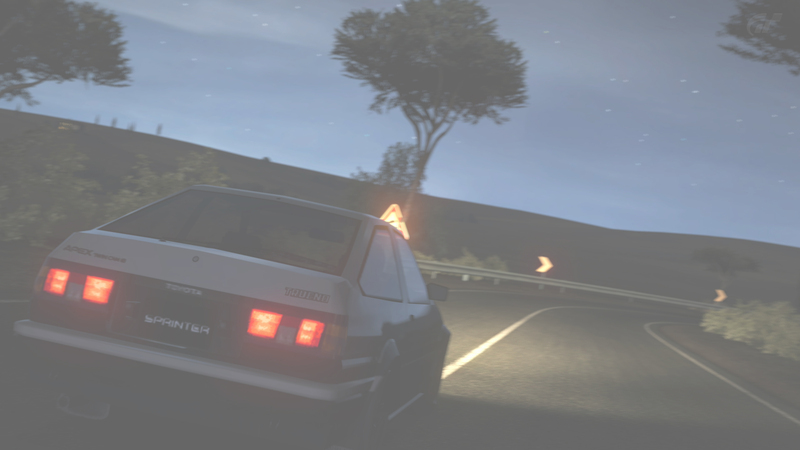 i ran it on the touge on the old account before i started circuit racing and now i use it on the circuit too. the acura and the honda are really grippy, really agile cars. be careful tho kraze because they love to 3 wheel quite a bit which slows u down on the touge. You guys are still my idols, keep it up. ill get back to the 360 once i get a chance. 32.4 ?? Just get it clean so you can be #3 on the LB already! Lol Kraze, and Bukkaz wont be happy till he breaks the game with his insane non aero Fujimi times. What is your Accel and Decel set too? Last time I drove that car it revved to 8k but max power was at 6k which is LOW so you can try shortening the gears a bit more and upshift earlier so you never pass over 7k rpm. Then maybe take off the cams? With stock cams you'll make less power at the redline but it'll be more controllable because there's less power. And upshifting earlier will let you use the rest of that power on the straights where it counts so it's worth trying. I took the cams out and put more engine parts in to make up the p.i and I shortened my gears, feels a little better but still steps out suddenly, I think it's 50% the tune and 50% my driving style, need to change my style to suit the car I spose, there are conversions for it such as a turbo, centrafugal supercharger and a 1.4 turbo engine, would any of them conversions work do you think? The supercharger wouldn't do anything, a turbo could either make it better or worse depending on the boost level and the rpm it kicks in at, but the last one could make it VERY different if we're talking about a whole new engine. But if none of them work then it's right down to the nature of the chassis and there really isn't anything that can be done besides to cope with it with a different driving style and suspension tuning like you said. I'm still shocked you can get that thing to 32s when I drove it it felt like a front heavy AE86 with even more power than it can handle. I learned that I was losing up to 20hp on the upshifts with my RX8 since the max 250hp is only made at 8700 rpm and below 8k I only get 230hp. So in order to stay between 8k - 9.5k rpm I revised my gearing from 3rd-6th gear by shortening them. Then I adjusted my brake balance towards the rear to eliminate understeer. SO close to that 33 now! Was messing around with a lotus elise, no aero of course. after like 15 runs or so, got a 4.30.356. Intentionally dirtied it so I don't put in on the LB. I always use Konas ghost as a marker, very few of the runs I was able to match or even be ahead of Konas ghost. Without aero it isn't as cheap as I thought.